First, I want to sincerely thank everyone who checked out my L16 review from several weeks ago, and for all of the nice comments that I’ve received in return from you all. It’s rewarding to know that folks are reading, that I’m contributing to your perceptions of the L16 and that I’m also contributing to the improvement of the L16. I’ve been away this past month on a shooting trip and chose to not take my L16 with me. It’s still too raw and there was a limited amount of time, space and energy on this shooting trip. A few days ago, I got the L16 out and wanted to take it for a walk in my neighborhood to check some things out. Actually, I got the camera out and attempted to turn it on – and the battery was flat-out dead. That was a disappointment that the battery would drain away while the camera sat unused for five weeks. I’m fairly certain that the battery was fully charged when I set it aside. I also discovered when I got home from my walk and was processing photo files that when the L16 battery died, the time/date info reset itself, likely to the original manufacture date. Again, not cool. When I was away on my trip and using my Pentax SLRs, I realized that I may have been unfairly comparing the L16 to them. I typically set my aperture on my SLRs to the mid-point of the range for maximum sharpness. Most photographers are aware that at a wide-open aperture you’ll realize a shallow depth of field and a fair portion of the photograph out of focus, which is great if that’s the effect you’re going for. At the other end, you get maximum depth of field when you close down the aperture as much as possible, which can be great when you have a subject that’s relatively close to the camera and you also want the background to be in focus. But, the consequence of using a small aperture is that you’re more likely to find chromatic aberrations in your photograph, particularly on the fringes of your photograph. The best setting, in my opinion, is to shoot at the aperture’s mid-point so that I get decent depth of field, sharpness/detail over the whole of the image, minimize any out of focus areas and minimize/eliminate lens chromatic aberrations. If my lens has a minimum aperture of f/32, then I’ll shoot in aperture priority mode at f/16. Similarly, several of my lenses have a minimum aperture of f/22, so I’ll shoot at f/11. When I processed the L16 files in my earlier review, I set the Lumen (beta) software for minimum aperture, which is f/15.2. I realized that this might be an unfair comparison between my Pentax SLRs and the Light L16, so I took some new photographs with the L16 and processed them at minimum aperture and at the mid-point. The early version of the Lumen software (v. 1.2.4) uses a slider to adjust the aperture, so it’s not possible to actually know the final, numerical aperture of the processed photo until you check the EXIF data in Lightroom or Photoshop. Below are the results of this test. I *hope* that you can make out the slightly better resolution of the file processed at f/15 when compared to the file processed at f/9. You should be able to “click” on the above images and view them at full resolution in a new window, so that might be helpful. The bottom line for me and my style of shooting – maximum sharpness – is to process L16 files at the smallest aperture. Later on my walk with the L16, I photographed a nearby park and stormwater retention pond – nothing exciting, but similar to my normal subject matter. My results were similar as to what I experienced before. I won’t go into a whole lot of detail, but refer you to my previous review. Images generally look good at first blush, but then when reviewing images at 100% enlargement in Photoshop, issues are revealed. In the first review there’s an example of the airplane on the apron that shows the individual L16 images that were combined to create the full-sized image. I did the same kind of analysis with several of the images from this walk and the same issues are apparent, particularly on the edge of the images and where there’s overlapping detail. I’m not including those “inverted edge” images in this review. Based on some of the comments I received, I’ve placed the photo files from my walk into a Dropbox folder and am sharing it with you, if you wish. Just “click” on the Dropbox link here. I’ve uploaded seven photos, representing ~1.2 gigabytes, so you’re on your own. These LRI image files run about 170 megabytes a piece. I believe that you may also download the latest version of the Lumen software to process these images via this link: Lumen download. I won’t go into a lot more detail on these issues, other than to just reinforce them. The basic issue when you closely examine an L16 image file is that the camera has difficulty capturing detail in busy areas of a photograph. Here are a couple of examples. The lack of detail not as obvious in this photograph as I’ve seen a few others because the whole portion of this image is busy/complex. Here’s a second image where the issue is more obvious; first the full-sized image and then the 100% cropped portion of a piece of a plant from the left side. That portion of the plant that is in the sky is nice and clear. 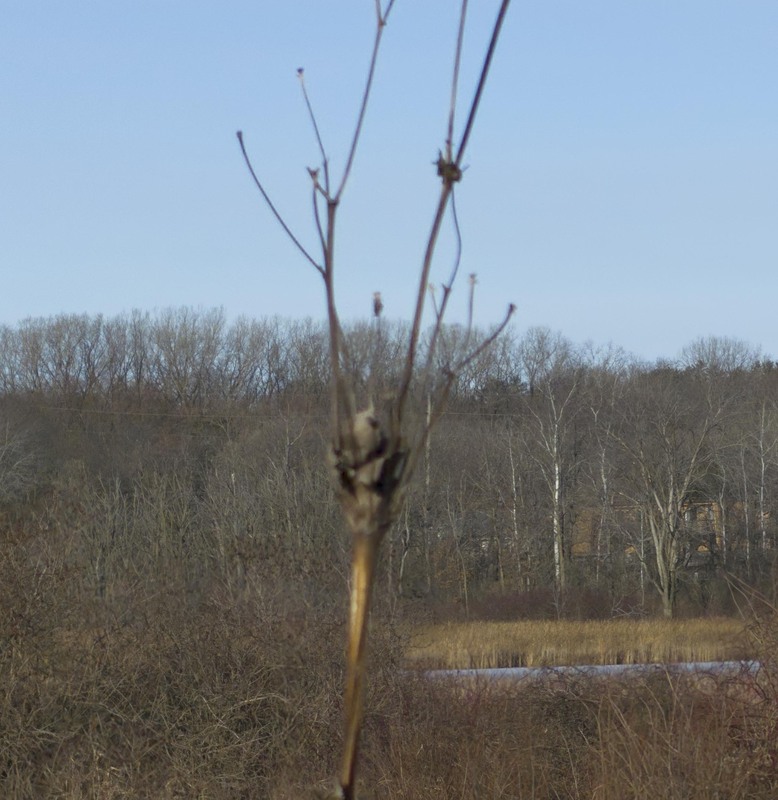 But, the same plant, when it’s surrounded by the woods and cattails in the background, is blurry. It seems to me that when there’s a clear difference between the various elements of the L16 image file that the Lumen software has no problem figuring out which of the several image files to use. But, when there are complexities in the image, those overlapping image files confuse Lumen. Again, this is with the first version of the Lumen software. A second example that better demonstrates the possibilities of the L16 camera – first the full-sized image followed by the 100% enlarged cropped version. Full-sized image, shot at 75mm. This enlarged and cropped portion is from the central part of the file where there isn’t really any overlap between the various portions of the full-sized image and it’s a pretty clean shot. So, in my mind, the individual cameras in the L16 computational photography setup are pretty decent; the problem is when the (old) Lumen software overlapped the various portions of the individual files to create the final file and it can’t quite figure out which portion of which image to use when there’s complexity of detail. I hope that you’ll also notice that there’s a bit of chromatic aberration on the bright, reflective cattail leaves on the right center of the image. The chromatic aberration is a lens issue and not the software. The L16 photos processed in the first post about the camera and (so far) in this post were created using Lumen version 1.2.4. When the Lumen software is opened there’s an automatic check for updated software and you’re given the option to download it and use it, if you wish. I’ve been avoiding any updates so that I could complete this post (and, because I was on travel). When I chose to update the software through Lumen, I received an error message – FAILED TO EXTRACT UPDATE. Bummer. Fortunately, Light sent me a link to the new software in an email in mid-November. Per the Lumen instructions, I deleted the Lumen application file (and not any other supporting files) and then opened and installed the downloaded update (Mac version 2.0.58). Based on the release notes, I’m not anticipating any improvements with the issues that I’ve been experiencing, but we’ll see. I like the interface on the updated software. I’m now able to clearly choose my aperture on the slider. There also are a nice range of image editing features that you find on basic image editing software – exposure, color temperature & tint, saturation & vibrance, contrast and sharpening. The EXIF information also clearly appears above the editing controls, rather than having to fish for it with a command. Most of these editing tools are what I already use in Lightroom and Photoshop, but it is nice to have them if you don’t have access to those (or similar) photo editing tools. The only other tool that quickly comes to mind that I’d like to see is image cropping and rotation. Driveway detail, f/15.2, processed in latest version of Lumen. Driveway detail, f/8, processed in latest version of Lumen. To my (old) eyes, the file processed at f/15.2 still looks better so no apparent change in the software in this regard, but then, I wasn’t really anticipating/hoping for any change. Woods detail processed in latest version of Lumen. I didn’t quite crop the same portion of the woods in the second processing (nor is the color the same – I didn’t edit the color in the second processing, just the first), but the basic images look pretty similar to my eye. I didn’t feel that the first processing of this image showed much of what I was hoping and the second processing doesn’t seem to improve (or not improve) on it. Again, this test is a wash.
Stalk detail processed in latest version of Lumen. Again, the cropping is slightly different and the colors are different since I didn’t edit the colors in the second processed image, but the detail appears to me to be the same in the two versions: decent detail when the image isn’t complex, muddy detail when the image is complex. Again, no change with the updated Lumen software. Lastly, I looked at the wetland image where the dried cattails dominated the scene and there also was no obvious change (to me) in the details of that image. Still good detail since that portion of the image was captured by an individual L16 camera, and the chromatic aberration was still present. The purpose of this second review was to consider the possible differences in processing images at the aperture midpoint, as well as to quickly evaluate the updated Lumen software. Regarding processing at different aperture settings, the L16 camera and Lumen software appear to provide the sharpest detail when the image file is processed at the smallest aperture. This result isn’t any surprise to me, but it is good for my knowledge and how I would likely use the the L16 and process its image files. I also took some new photographs with the L16 and processed these image files in the first version of the Lumen software that I downloaded (v. 1.2.4) and also processed these images in the latest version of the Lumen software (v. 2.0.58). The updated Lumen interface offers more editing features and is an improvement, but there’s no obvious difference in how Lumen’s algorithms combine the individual images to create the final image – those images still possess poor detail in complex areas of the image. The Light L16 and its accompanying software, Lumen, are still a work in progress. There has been no improvement in image quality over the past couple of months. A couple of the major reasons that the L16 piqued my interest is that I was hoping for a lighter, smaller camera that was capable of great photographs. These “lighter & smaller” features were important to me in a couple of settings – aerial photography and backpacking. A smaller, lighter camera would be obviously easier to handle while flying, and a smaller, lighter camera would reduce my load while backpacking. But, the L16 is still not in a place where I would use it for aerial photography. I’m (again) planning an extended backpacking trip for next summer and would not take the L16 because of the image quality. I really want to take a camera with me that will create magazine-quality images (that’s my work!) and the L16 isn’t there yet. My smaller Pentax SLR (K-1) and 24-70 zoom lens are more than twice as heavy as the L16 but I’m confident in its abilities to capture great images. As improvements in the L16 camera and its Lumen software come about, I’ll try to keep you up to date with my experiences. And, if you have any L16 experiences to share – especially if you feel or know that I’m not handling the camera in a way that could improve on my results – please feel free to let me know. Again, I want the L16 to work and be a functional part of my camera equipment.